Pete has hiked in Switzerland, New Zealand, Alaska, Patagonia, Mexico, Canada, Hawaii, and many places in the western United States. Here are some of his milestones. Summer 1970 First White Mountain hike (Mount Washington via the Jewell Trail). 10/13/86 Finished the NH 4000 footers (solo). 6/24/95 Finished the NE 4000 footers (accompanied by Patty Wyner). 2/12/00 Finished the NE 100 Highest (accompanied by Ed hawkins, Kim Rexford, Kin Liversidge, Sue Kirk, Jeff Cohen, Carl & Jedwiga Rosethal, Anne Gwynn, Lyn Beattie, Dave Moore). 2/23/97 Finished the winter NH 4000 footers (accompanied by Ed Hawkins, Jim Maurer, Susan Broom, Pete Donnely). 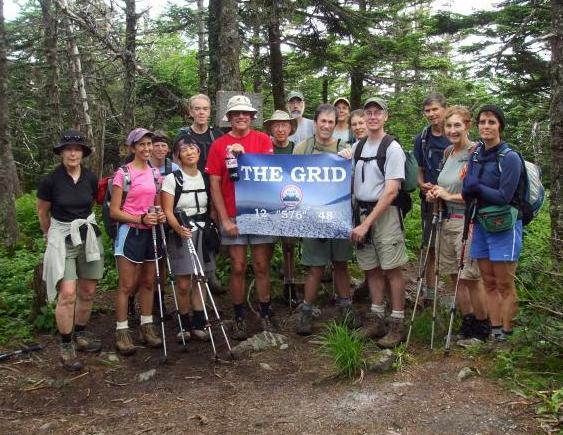 10/16/04 Finished The Long Trail (accompanied by Patty Wyner). 10/31/05 1000th NE 4000 footer - Lafayette (accompanied by Rebecca Sykes). 1/15/11 3600th Named NE Peak - Crow's Nest (accompanied by Darcy Hobgood).